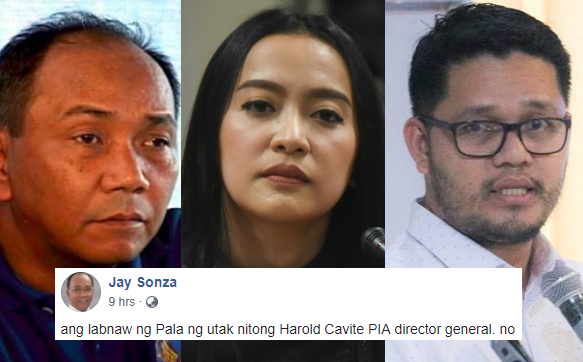 Home / Opinion / Jay Sonza Defends Mocha, Slams Director-Gen. of PIA: "Ang Labnaw Pala ng Utak nitong Harold Clavite!" Jay Sonza Defends Mocha, Slams Director-Gen. of PIA: "Ang Labnaw Pala ng Utak nitong Harold Clavite!" It is a well known fact that the present administration is pushing for a switch in the Philippines type of government, to Federalism. Its strong desire to change the manner in which the nation is run has obviously been met with feedback from political analyst and netizens alike. And in the most recent live vlog of Presidential Communications Assistant Secretary Mocha Uson, things got a little bit out of hand when pro-Duterte blogger, Drew Olivar, played out a dance routine to promote federalism through a jingle entitled "Pepedederalismo." Parody account 'Malacañang Events and Catering Services' trimmed the 55-minute live video to feature the segment. to Asec. 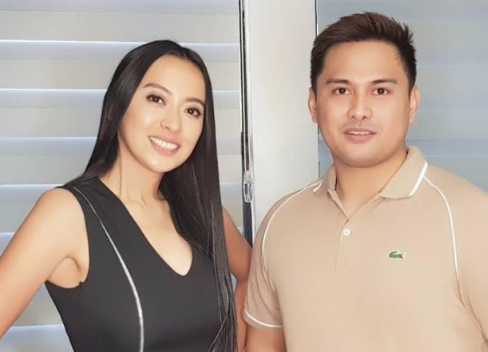 Mocha which in return prompted a fellow Presidential Communications Operations Office (PCOO) executive to asked Uson to publicly apologize and go on leave. Yesterday, July 7. 2018, Harold Clavite, Director-General of the Philippine Information Agency (PIA) under PCOO , took to social media to say he found Uson's video offensive, an insult to other government workers and also degrading to the women and mothers in their communities. Various reactions have surfaced online after Clavite's announcement. Others say that Asec. Mocha only deserves the decision of PCOO, while some, took on her side and defended her from the ire of the public. One of those who defended the PCOO Asec is no less than, veteran broadcaster and former TV host, Jay Sonza, who is known for being fearless in speaking his mind over various national issues. On his recent Facebook posts, Sir Sonza took on Uson's side, defended the latter and even commended her, for according to Sir Sonza, what Asec Mocha did, just stimulates talks on federalism and indeed a brilliant yet unintended scheme for an awareness campaign. "Kudos to Margaux. you may not be brilliant in the eyes of many but surely your "Pepe and dede" post arouse talks on federalism. what a bright but unintended strategy for an awareness campaign. Iyan ba ang boba? Mag isip isip nga kayo! ", he wrote. On the other hand, Sir Sonza also posted another fearless opinion and slams the Director General of PIA for allegedly finding faults on others while he himself is not doing anything relevant on his office. The veteran journo then exclaimed that the man should be fired for gross incompetence. "Wala Na ngang ginagawa and lakas PA ng loob na Punahin ang iba. this guy should be fired for gross incompetence. ", he added. 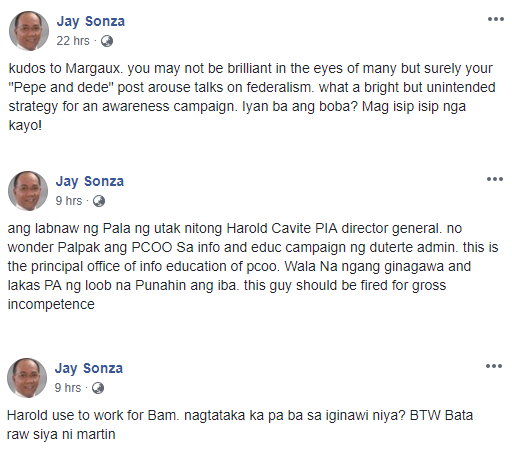 Likewise, Sir Sonza made another revealing post by announcing that Harold Clavite purportedly used to work for Senator Bam Aquino, no wonder why he made such decision to Asec. Mocha Uson. "Harold use to work for Bam. nagtataka ka pa ba sa iginawi niya? ", he uttered. "kudos to Margaux. you may not be brilliant in the eyes of many but surely your "Pepe and dede" post arouse talks on federalism. what a bright but unintended strategy for an awareness campaign. Iyan ba ang boba? Mag isip isip nga kayo!" "ang labnaw ng Pala ng utak nitong Harold Clavite PIA director general. no wonder Palpak ang PCOO Sa info and educ campaign ng duterte admin. this is the principal office of info education of pcoo. Wala Na ngang ginagawa and lakas PA ng loob na Punahin ang iba. this guy should be fired for gross incompetence." "Harold use to work for Bam. nagtataka ka pa ba sa iginawi niya?"